Wow! Is it Wednesday already??? I've got to remember that Tuesday is the day to write your email! Yeah, we are sickies alright. It seems like I can't get up and get going. First, my leg, then I get the flu or whatever it is, then last Saturday I chopped off my finger while I was making salad. How many salads have I made in my lifetime? It was actually only the fleshy part of the middle finger on my left hand. It wouldn't quit bleeding so we had to go to the ER. They cauterized it to stop the bleeding. I was not allowed to bump it or get it wet. So I sit on the couch. ho, hum! I can't play my violin, organ, nor piano. Nor cello and viola! It's hard to have a cut finger! Today was grand opening of Sprouts. It's a health food grocery store. I had fun shopping their good deals this morning. Yesterday was my first time this year teaching orchestra. It went pretty well even though I didn't do any playing. Monday I had a private viola student. I was able to play a little without using my 2nd finger. I just moved my 3rd finger back and forth. We had a good family night and listened to Elder Packer give a talk entitled, "The Choice". It was about choosing righteousness and eternal life or choosing wickedness and misery. Sunday I stayed home from church because of my finger. You would think it's just a little thing--but it's a big deal! I heard that Dad and David bore their testimony and that testimony meeting was really good. Dad loves it when he can attend our ward sacrament meeting. He won't be able to for awhile because of rehearsals after the broadcast for a couple of months. Stake conference is next Sunday and they had to get another organist because of my "injury". Saturday was the big injury day. I was cutting cucumber and with that Cutco knife of Steven's, I cleanly sliced a little over 1/8 inch. I called the boys, Henry and Trevor down to help me. Dad was not home and didn't take his phone. So they were trying to help me. I put a paper towel over the wound and put pressure. So when I did that, it wouldn't bleed. But whenever I took off the pressure, the blood just flowed out. So Dad came home and went to Walgreens. We tried putting a gauze bandage, but it immediately filled up with blood. So Dad took me to ER. They were very wonderful and it was quick-no waiting. I thought it was funny that they asked me if I had received the "waste-your-time flu shot". LOL At night we had our traditional pizza and movie night. We watched a cleaned-up version of "Liar, Liar" with Jim Carry. It still had a few bad parts. I can only imagine what the un-clean version is like! It has a good moral, though, about telling the truth. Friday Dad and I took Marie and Todd out to Chuck-a-Rama for Todd's birthday--even though it was way back on December 3rd. LOL We had a lot of fun. Aurella was soooo cute! I should start taking pictures. Thursday, I slept allll day long. I really felt like I needed my rest. Wednesday, at midnight Dad and I cooked breakfast for Henry and his friends. Next time I am definitely buying frozen waffles that you pop in the toaster! We got a puzzle to put together, but I think I only put three pieces in the whole puzzle. It was a hit at Henry's New Year's party. Beth really likes to do puzzles, too! Yesterday, Beth invited Abrielle and Nathan over to play with Marci. We had fun. Nathan is potty-trained! So on February 1st we are having a Grandma sleepover with Abrielle and Nathan. We will have to watch Groundhog Day. Maybe. I need to make sure it is kid-friendly. LOL I got to hold Valerie. She even smiled for me. Well, you get the news a week late. Next time I will write on Tuesday, then you will get current news. I love you sooooo much. I'm very proud of you for working so hard learning all you need to learn. I loved reading your Spanish. It was good. Tambien, tango un testimonio de Jesucristo. El vive y es muy cerca a nosotros. Su iglesia, La Iglesia de Jesucristo de Los Santos de Los Ultimos Dias es la iglesia verdadera! Estoy muy animado a servir por Jesucristo y que Usted sirve tambien! Estoy muy agradacido por un profeta, El Presidente Monson! Translation: Also, I have a testimony of Jesus Christ. He lives and is very close to us. 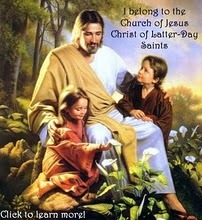 His church , The Church of Jesus Christ of Latter-day Saints is the true church ! I am very encouraged by Jesus Christ and serve you serve too! I am grateful for a prophet , President Monson!